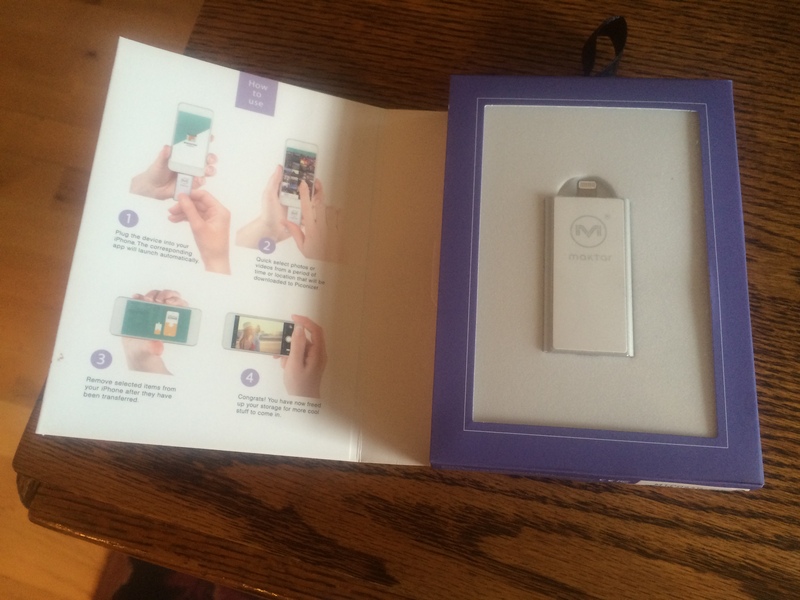 … to continue with this dumb saga, whew, of my i-Phone memory being all used up with photos and videos, I declared the problem solved when the piconizer arrived in the mail from my super-techno-savvy brother-in-law, Victor. Great! 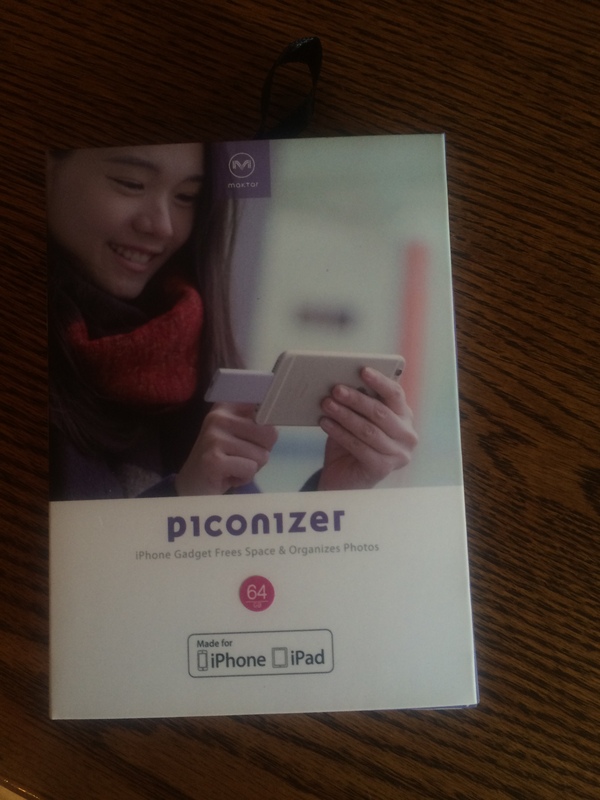 Just upload the piconizer app to i-phone, connect gadget to phone like a thumb drive, transfer photos, delete photos on phone, voila!- I’ve freed up storage on my i-Phone. Right? Wrong. I couldn’t download the piconizer app to begin with because my i-Phone didn’t have enough memory, even though I had already deleted scores of photos and videos. Okay … fine. I deleted several apps. Rebooted my phone. 3 times. Still no memory available (in ‘usage’ under settings). “Did you get it to work?” he asks. It was the link for the Apple search question: “Cannot free up storage space after deleting all photos.” There’s a pretty interesting discussion here about this problem – how comforting to know I have lots of company. Makes me glad I didn’t buy more memory on icloud. Ah … remember the good ol’ days with i-Phones: When you were low on memory, you just deleted photos, and maybe a video or two, and gained the memory back. Anyway, Victor and I went through the process over the phone step by step. When we got to the deleted photos album sure enough, it was full of photos. 240 photos and 35 videos. “Delete them.” Victor commanded. Dang! I wanted to go back through them one more time and maybe save ones that had been deleted, you know, under extreme duress. There, now you have all the details involving a technologically disinterested Type-A personality embroiled in a picture hoarder i-Phone memory meltdown. Although I’m pretty sure I’m more smart than dumb by not upgrading my operating system. Am I sounding more technologically savvy yet? In an effort to keep up with the world of fast advancing technology my hubby and I sprung for i-Phones. Except the new smart phones keep advancing faster than we are and we never have the latest greatest smart phone. One reason is, of course, price. We bought the i-Phone 3 when i-Phone 4 was out (at 1/6 the price or something – 50 bucks). I accidently discovered the camera on the i-Phone 3 and found it so user friendly that I soon amassed 600 photos. I love all my photos. And I learned not to upload my precious photos onto the computer and delete them from my i-Phone, because I never see them again. I just don’t organize or bother finding photos on my computer. So, photos stay on my i-Phone. When we update our phones I just transfer all my photos and videos to the new phone. So by the time I updated to i-Phone 5 (when 6 came out) – I transferred about 2200 photos and 25 short videos. My phone has a few apps, that I don’t use much. There’s no downloaded music on my i-Phone. 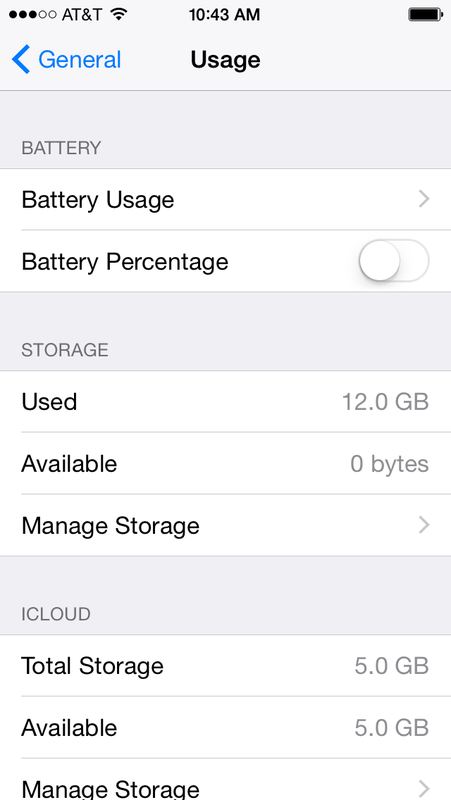 64 GB of phone memory seems way excessive – so I opted for 16 GB. What the? How can this be? How did I even take that last photo, then? What about those deleted apps? What am I supposed to do here? I know that the 5 GB available on icloud is not enough. Has Apple Inc. devised some diabolic scheme to persuade old fart technologically disinterested picture hoarders into signing up for an icloud storage plan with montly payments? Miraculously I still had enough memory to take a selfie. 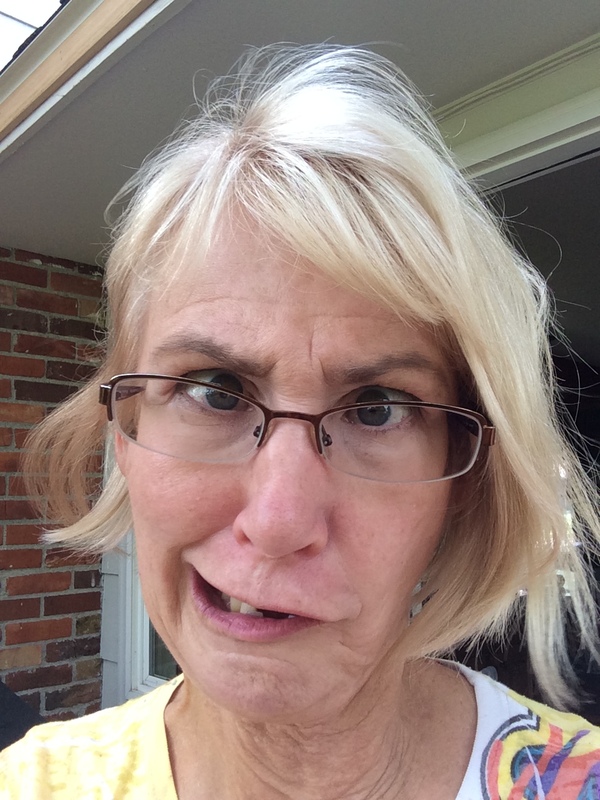 Old fart picture hoarder vs. Apple. This picture reminds me of a previous blog I wrote when I got my first i-Phone. It’s from June 15, 2009. Geesh. 6 years ago. Here’s the link. . Well, if it isn’t the link you can find it easily. It’s the only other blog I wrote under the category ‘technology’ (what a surprise). There’s a selfie in that one too. Well, I was younger then, but wiser now. What do you think? How does this get resolved? It’s pretty funny that I have an i-phone. I am way over my head with it (surprise! surprise!) – I mostly try to ignore all those colorful icons on the i-phone screen that could be connected to programs, links and technology – all accessible with a mere touch of a finger! “What programs, links and technology?” that’s what I say. Those things only complicate my life. The only reason I got an i-phone is because my husband got an i-phone. We were both perfectly happy with our old phones but our cellular company was bought out by AT&T and we were forced (and reaching the deadline) to get new phones. We were at the AT&T store, and my husband started fiddling with an i-phone, and a young, perky female sales associate was on him with her sales pitch like a starving fly to dried jelly. I saw the writing on the wall, a vision if you will, right there on the spot: Of me sitting with him at the hearth at home, craning my neck, watching him play with his i-phone – checking on the current weather in London, typing out witty texts to our sons on his i-phone keyboard (with its keyboard sound effects), doing instant internet fact searches to back up his conversation, listening to his favorite i-tunes … I … wasn’t having it. With two i-phones we can have concurrent internet searches and I’ve even beat him to the facts a couple of times. Well, one time. I totally text our sons like never before (okay, maybe ten times by now) and I have nearly a hundred photos stored on my phone, compared to his <10. So there! He does lots of other stuff quite comfortably with his phone, about which, I am clueless. We could download God-knows-how-many i-tunes off the, uh, i-tunes website? I don’t know. I’m not in a big hurry to know. I like my CD’s. I still have two boxes of cassette tapes I cherish by fabulous artists like Supertramp and Carly Simon. I immediately toss dept. store fliers advertising Wii’s and i-pods and … i-pod docking stations (docking stations? Shouldn’t those be confined to outer space?) I still have much to learn about my i-phone, to ‘simplify’ and enhance my life. Yeah, right. I’d better go now and throw out our TV with the bunny ears.